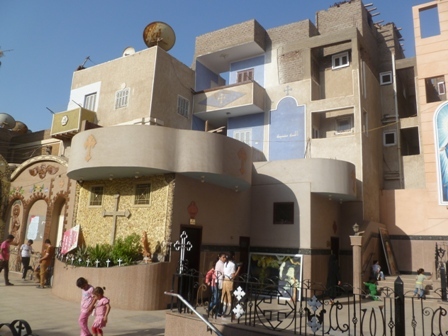 From April 25-28 I traveled with Arab West Report through a few Upper Egyptian Holy Family sites, places Mary, Joseph, and Jesus are recorded to have stayed according to Coptic tradition. This travelogue will share some of the insights and anecdotes learned along the way, by means of pictures taken at each location. Please click here for the full commentary at Arab West Report. 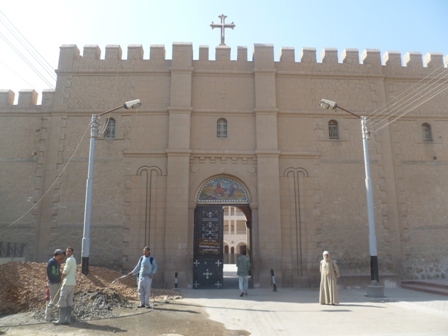 This posting represents the third of the articles I was able to write following the trip; I will only post the photos not used in writing about a cancelled Palm Sunday march through streets of a mostly Christian village, or about local perspectives of Copts toward the elephant in the room – emigration. But the Arab West Report article is a good nine pages long featuring 35 photos. Most only have a paragraph or two of reflection, so it is easy reading. Here it will easier – pictures with a sentence or two. Please enjoy both here and there. With professional photographers Norbert Schiller and Dana Smillie. 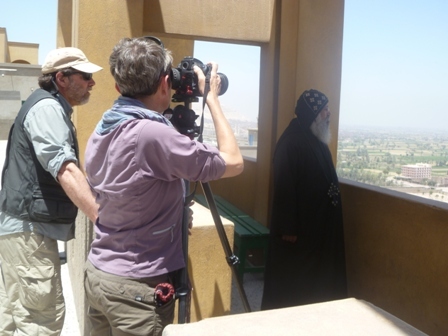 Lining up a picture of a monk at Dronka Monastery, purported to be the southernmost extent of the Holy Family in Egypt. This is a Holy Family Tree at Sarabamoun Monastery, near Dayrut. 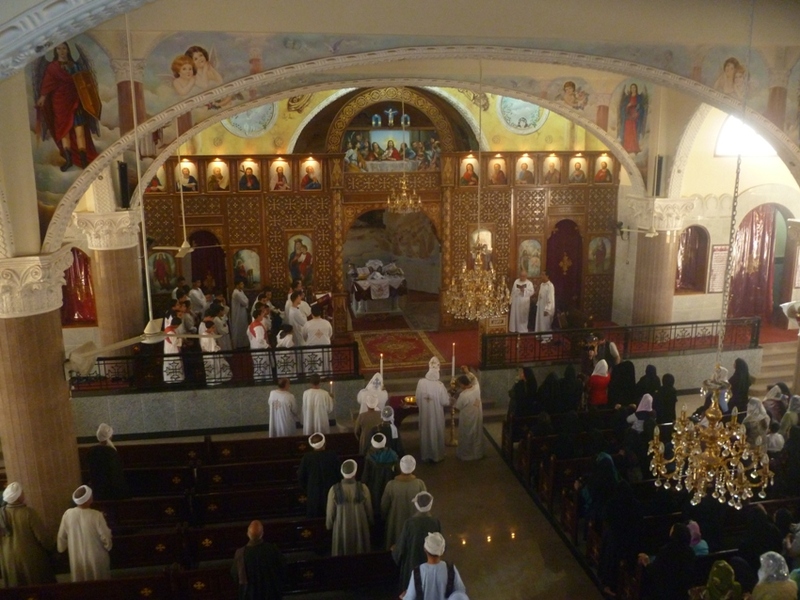 Coptic tradition says they paused to rest under its shade. 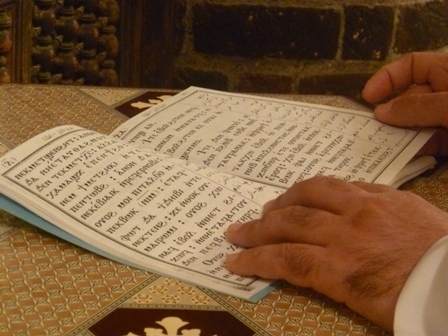 The white papers represent the prayers of pilgrims seeking intercession. The large tree in the upper right is the Holy Family Tree. 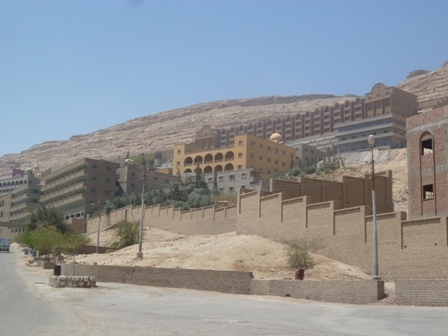 The Sarabamoun Monastery is quaintly isolated in agricultural land. Here, a local farmer pauses by the side of the road. 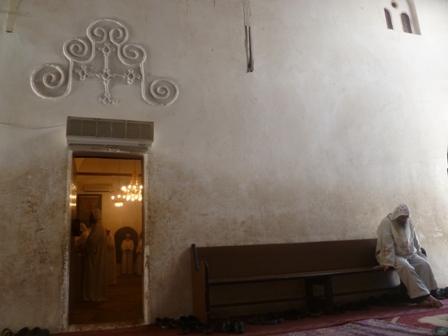 The village of Saragna is 90% Christian and on the way to perhaps the most holy Holy Family Site, Dayr al-Muharraq. 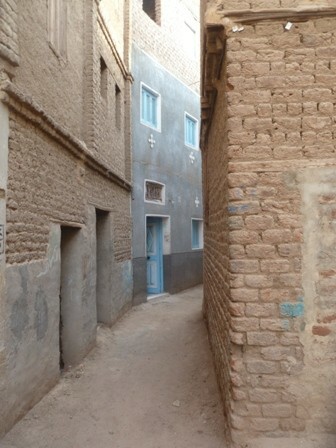 It is a very traditional village built on the ancient pattern, extending out circularly from a high point above the elevation of the Nile flood, now halted by the Awsan Dam. The mayor and his deputy of Saragna. He is the 4th generation in his family to hold the position. Homes in Saragna pushing up against the massive new church recently built. Some homes were purchased and destroyed to make room. The greatly expanded Church of the Virgin Mary in Saragna. It cost just shy of $900,000, but had much free volunteer labor offered by residents. Most of the money came from Saragna men working abroad who tithed their earnings. The inside of the beautiful Saragna Church sanctuary. The Saragna church is modern in every sense of the word. 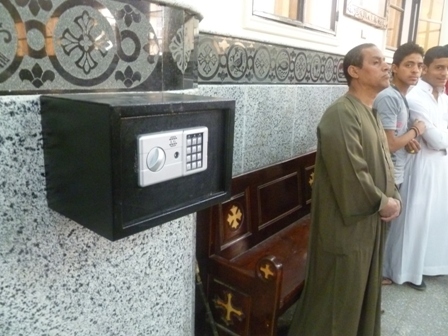 Here the traditional wooden offering box is replaced and made more secure by electronic safe. 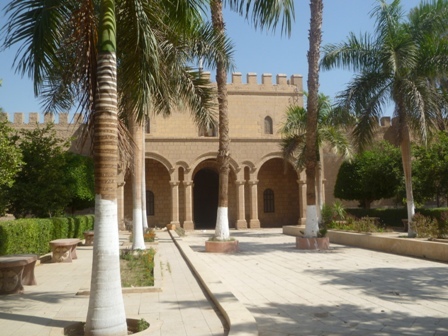 The Monastery of Dayr al-Muharraq is esteemed as the southernmost extent of the Holy Family in Egypt. If this seems to contradict what I wrote earlier, you’re paying good attention. Do read on below. 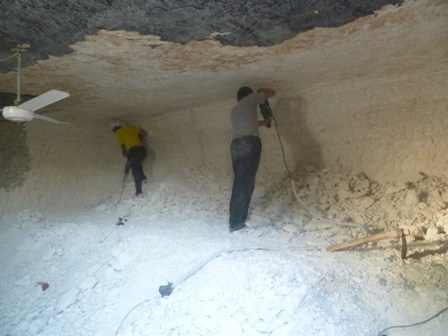 The walls are built to resemble the walls of Jerusalem, seeking to establish itself as an alternate pilgrimage site. Another example of the walls. For some reason I found this monastery strangely modern. It seemed more like a colonial villa compound than a place of asceticism. 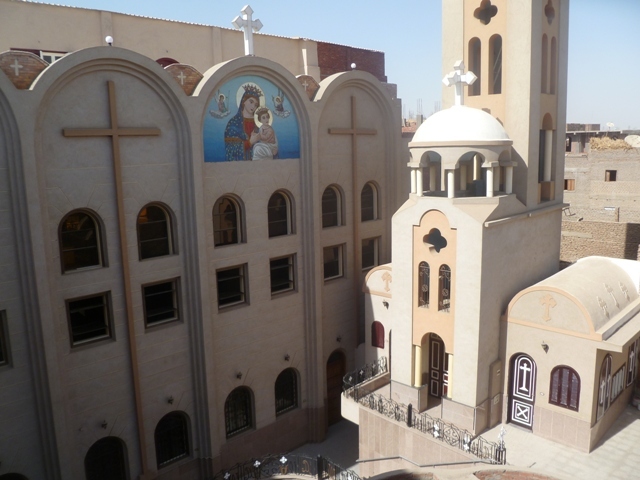 Almost all Coptic monasteries have been modernized. Here inside you can see the old versus the new. But here is old. It was great fun to watch the monks worship and interact. 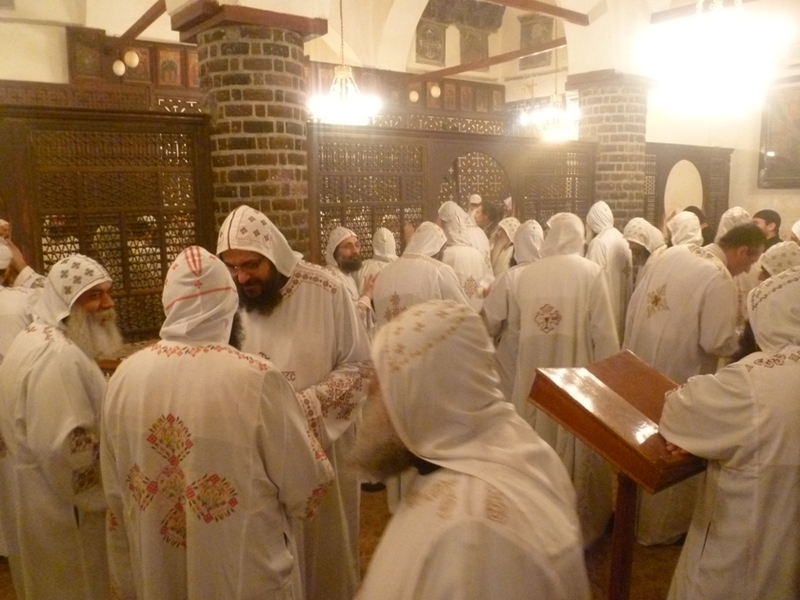 About 100 are resident in the monastery. Here a monk chants from the prayer book, joining his colleagues in unison. 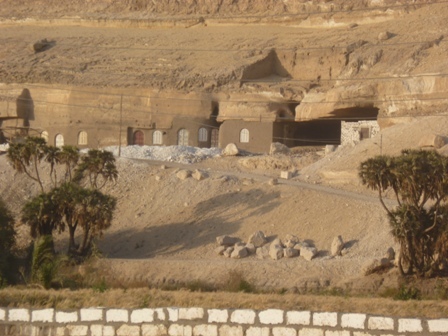 The chants were in the ancient language of Coptic, still used somewhat in the masses of Egypt but known only by a small group of specialized practitioners, such as in this monastery. I love this photo. 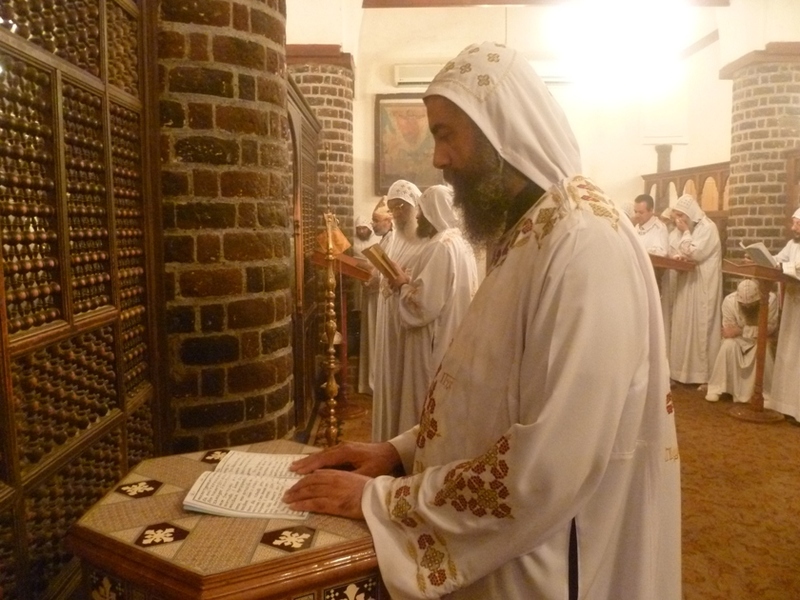 Monks in Egypt are strangely free to join or not join communal worship as they see fit. It is a very individualistic calling, largely left to one’s sense of how to walk with God. 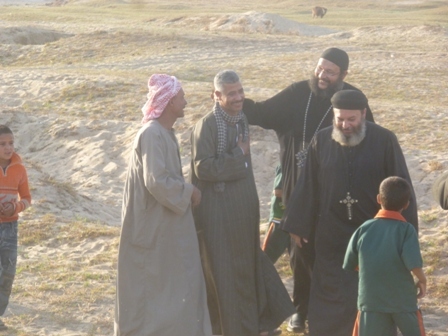 On the way to the Holy Family site of Qusair we passed by a new but very traditional village. 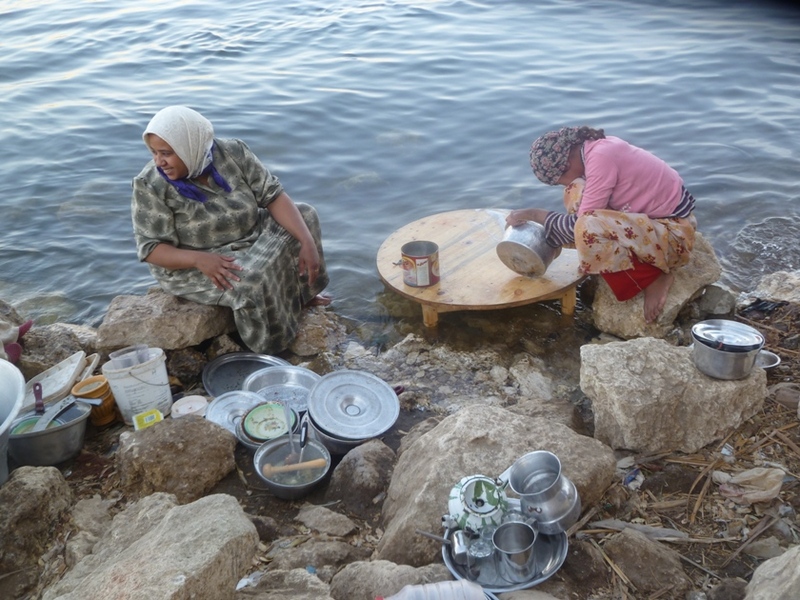 The women, Muslim, are doing dishes in the Nile. 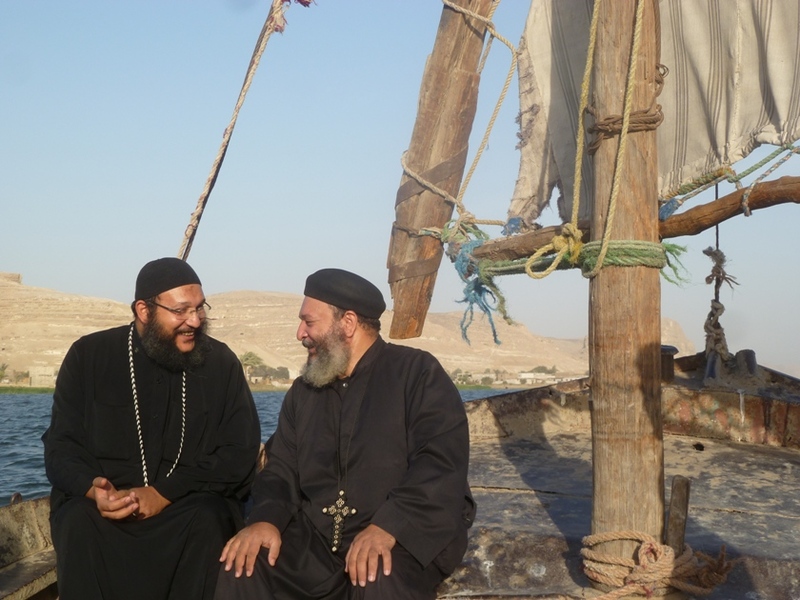 To get to the small chapel in a cave we had to cross the Nile in a traditional sailboat. 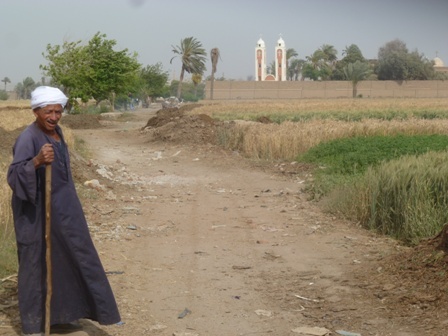 Upon arrival we were met by tens of Muslim women coming out of their homes and cheering. 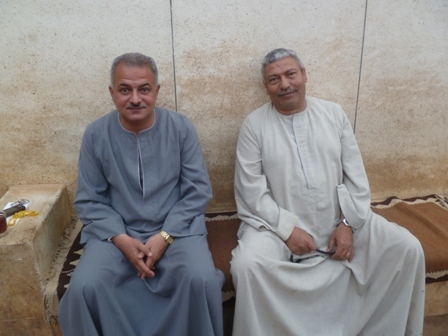 As it turns out, arriving just after us was a released prisoner returning home for the first time in six years. The priests joined in the celebration. 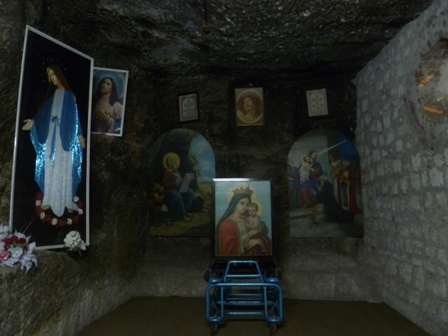 Upon returning north on the way to Palestine (from whichever location), the Holy Family rested in this cave before sailing the Nile. A small church is now inside; the priests lead weekly mass at 5am on Sunday. But we saw also the expansion of the site. The priests are preparing to host a summer festival for the first time, trying to increase the pilgrim awareness of this site. I fear it may ruin its pristine nature and tranquility. But can anything ruin this tranquility? 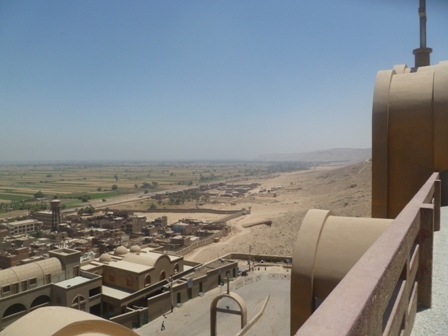 This photo looks down from the cave upon the small distance we walked from the Nile. Looking out from the monastery at the village and farmland below. 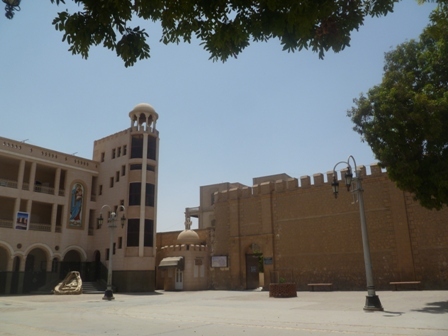 It is said the Holy Family tradition emerged here when local businessmen had a falling out with the monks of Dayr al-Muharraq Monastery. 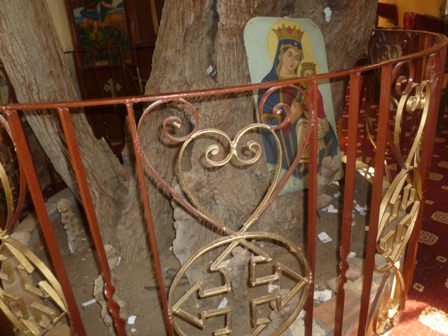 In the AWR article I provide a somewhat extended reflection on how possible pious fraud can both strengthen and damage the faith of Coptic Christians. Concluding our trip was the celebration of Palm Sunday at the church in Saragna. 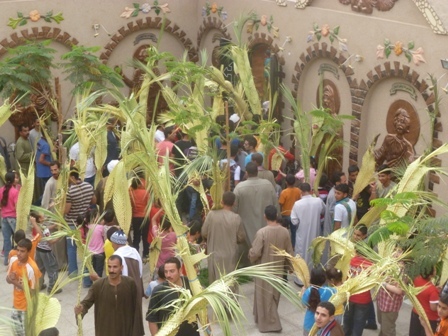 Here, in defiance of the priest’s decision to cancel the street parade, Coptic youth go out the gate as opposed to into the service. Please read that article for further context, but fortunately, no trouble occurred. 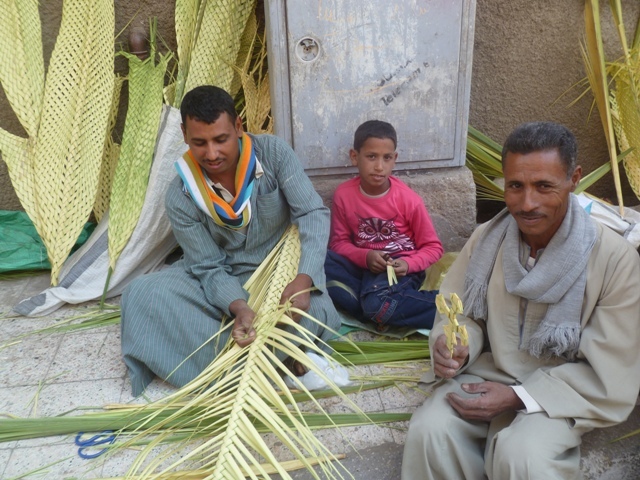 This is a good photo to close with, Coptic street vendors making palm leaves outside a church in Asyut. The little cross the man on the right is holding sold for $1. 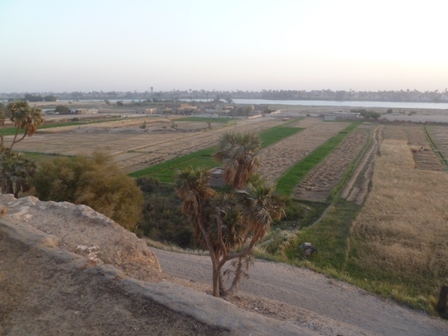 The trip took in far too much in far too little time to really feel like I learned about these sites and the reality of Christian life in Upper Egypt. But I am very thankful for this first opportunity, hopeful for far better understanding in the future. Please click here for a few more photos and fuller commentary.